Progress on the Klein Bottle Hat. Some retrograde, but progress none the less. First, I think the pattern as written is a bit overly generous in length. My hat is very deep to begin with. The direction to work the slit for two inches, then work in pattern for two more inches before beginning the decreases makes a log-shaped piece that bears little resemblance to the thumbnail drawing in the pattern. So I modified it a bit. First, instead of knitting 16 inches before beginning the slit, I shaved off an inch. Then I began my decreases immediately after the slit. 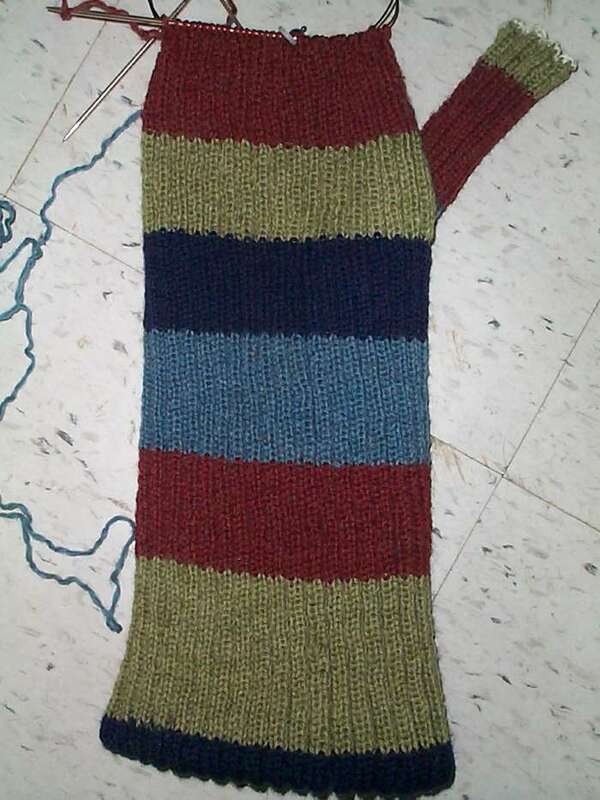 But even so, I think I may need to re-knit this again, starting at the second dark blue stripe, shortening the body a bit more, and beginning the decreases at the same time as the slit is worked. I’ll also change the rate of decrease so that the piece narrows faster. What you see here is the hat folded up into itself, with the skinny tail piece I knit first threaded through the slit. If I wiggle and drag it more aggressively, it does pull up so that the bottom-most blue stripe is eaten inside the hat. But still – I think it’s too deep, and the top isn’t narrowing enough, or quickly enough. Even though I’m on my third stab at working the top of this hat, opinions will be graciously accepted.